By January 1st 1916 the war, which was supposed to be over by Christmas was now 522 days old. And 1916 would be the year of the war, it would be the year that everybody remembers, it would be the year of Jutland, the year Verdun, the year of the Somme. The latter two are far and away the most written about and the most remembered battles of the entire war and they happened at the same time. The battles of 1916 would overshadow almost everything that came before and after. There was a point in post war France where over half of the books written about the war focused strictly on the 10 month struggle at Verdun. As of this episode there are 796 books on the Battle of the Somme on the United States version of Amazon. So just a massive amount of literature is written about all of these events, and there is an equal amount of controversy. All of that will of course be covered throughout the year. In this episode I just want to do a brief overview of the situation in each country at the end of 1915 before giving a brief preview of some of the big events of the next 50 episodes. No direct sources for this one, but lots of influence of all of the sources of 1916. Hello everyone and welcome to History of the Great War episode 61. This is our first episode on the events of 1916 and what a year we have in front of us. By January 1st 1916 the war, which was supposed to be over by Christmas was now 522 days old. And 1916 would be the year of the war, it would be the year that everybody remembers, it would be the year of Jutland, the year Verdun, the year of the Somme. The latter two are far and away the most written about and the most remembered battles of the entire war and they happened at the same time. The battles of 1916 would overshadow almost everything that came before and after. There was a point in post war France where over half of the books written about the war focused strictly on the 10 month struggle at Verdun. As of this episode there are 796 books on the Battle of the Somme on the United States version of Amazon. So just a massive amount of literature is written about all of these events, and there is an equal amount of controversy. All of that will of course be covered throughout the year. In this episode I just want to do a brief overview of the situation in each country at the end of 1915 before giving a brief preview of some of the big events of the next 50 episodes. There will also be a special podcast note at the end of the episode, so stay tuned for that. We start our beginning of 1916 review in the east, in Russia, the great behemoth of a country. Of the 7 beligerents we will discuss today Russia had the hardest time in 1915. They started the year by launching some successful attacks in Galicia against the Austrian armies and they looked to be on the ascendant on the south eastern front. There was a serious threat that they would make it through the mountains and onto the Hungarian plain at one point. Against the Ottomans they were doing great, in the frigid Caucasus they had withstood the initial Ottoman attacks and then began to advance into Armenia. But then the summer came, and everything fell apart. 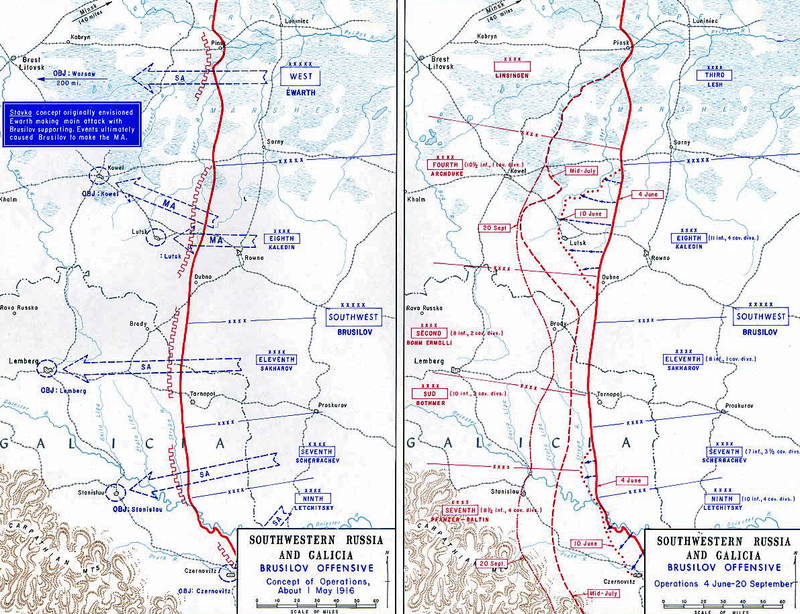 The Germans and Austrians attacked in what would be called the Gorlice-Tarnow offensive. Many history books also call this time frame The Great Retreat, which says everything. From the Carpathians northward the Russians retreated all along the line as they were battered from the mountains to the Baltic coast. During this time they lost an estimated 1.4 million men, hundreds of thousands of which were captured by their enemies. Only through some very timely retreats was the Russian army saved at all. These retreats lost them everything they had gained in Galacia, all of the holdings in Poland, most of Lithuania, hundreds and hundreds and hundreds of square miles of Russian territory. 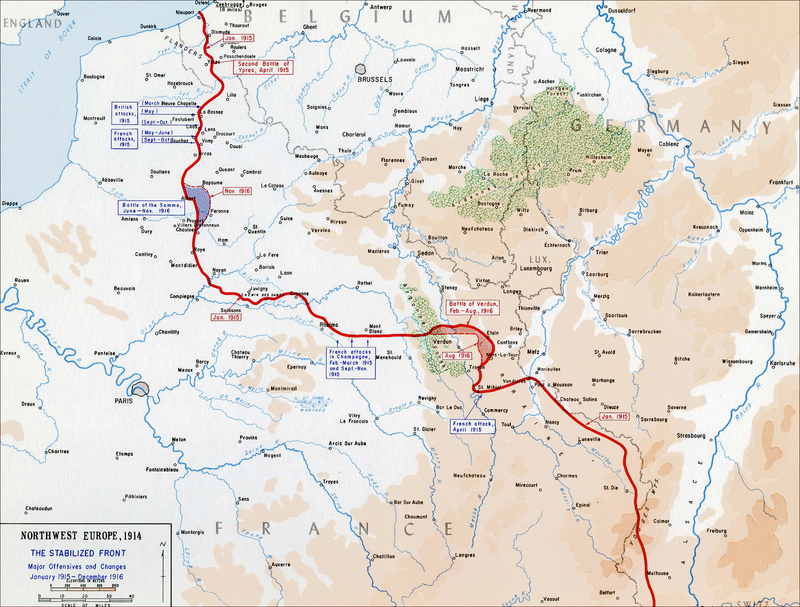 The only thing that stopped the advance was the over extension of supply lines for the German and Austrian armies. Which is Russia's second greatest historical defense tactic right after just waiting for winter. This great and catastrophic failure meant that as the year turned 1916 the Central Powers believed Russia to be tottering on the edge of ruin and completely incapable of offensive actions. The newest member of the allied coalition of Britain, France, and Russia was Italy. Italy had entered the war in 1915 and immediately went on the offensive near the Isonzo river against the Austro-Hungarian troops stationed there. Again and again and again and again they batted against the rocks of the Alps with nothing but failure and more failure to show for it. During the early battles the head of the Italian Army General Cadorna along with almost every other leader down to division level ignored the lessons of the war so far and just tried to batter away with insufficient artillery against prepared Austrian positions. However, as the year went on they did get better, they learned some things, but the results were mostly similar. By the time the year was over there had been 5 major attacks against the same Austrian positions on the Carso, in front of Gorizia, and on Mount San Michele and the Italians had suffered 280,000 casualties along the way. The line was moved a distance measured in yards along most of the front. The only solace that the Italian leaders could take was that there were many casualties on the other side as well, around 200,000, although the Italians believed that there were many more. In fact, the only thing that had saved the Italians was the weakness of the Austrian troops across from them, the empire was defending on 3 fronts by this point and just did not have enough troops to pursue attacks against the Italians. However, with the occupation of Serbia at the end of the year Austrian troops were freed up to do other things, and the Italian front was going to get far more action packed. If any word could be used to describe France in 1915 it would be persistent. Multiple times all along the front they had launched attacks against the German lines. First Artois, Second Artois, Second Champagne, Third Champagne, and all of the secondary attacks launched to support them. Just again and again the French 75s would roar into action and the French infantry would go over to the attack. But they were short on heavy artillery, and slow to change their tactics which meant that the breakthrough that they believed would bring mobility back to the battlefield remained far out of reach. They did continue to answer one question though, how can we improve the artillery, and the answer was always more, but even though they got to the point where the opening attack could be reasonably successful they still had not solved the problem of how to follow up that initial success and how to keep it going. It was only through the second and third echelons of infantry that the attack could keep the momentum necessary to breakthrough the depth of the German defenses and break into the open. Even though all of these failures Joffre remained the leader of the army and the French soldier, the poilu, kept attacking. There was no way for any French soldier to know at the end of 1915 that their greatest battle, their moment of greatest triumph and tragedy lay just a few months in the future. A huge portion of the French soldiers would cycle through the meatgrinder of Verdun, and none of them would come out the same again. The struggle ahead would break the French army in many ways, it would certainly never be the same again. Not in 1917 or 1918, not even a generation later in 1940. Much like their brother the French 1915 had been an abject failure for the British. On the Western front the armies did very little, with serious manpower shortages they could only play a supporting role in any French attacks. They held only a small piece of the front, a piece that saw the first use of gas during the Second battle of Ypres and witnessed several small ill fated British attacks. At sea, where the British were dominant, the Royal Navy continued their blockade of Germany but had been unable to catch the German Fleet in a decisive action. Sure there had been some smaller Battlecruiser clashes between the ships of Beatty and Hipper, but the battleships of both sides had been unable to come to grips with each other. Both the western front and the war at sea were overshadowed by the Gallipoli campaign. What had started as a small fleet action became a land invasion that became a stalemate that became an evacuation. The great British army beaten by the Ottomans. The leaders in London had often resisted the idea of sending most of Britain's strength to the Western Front but in 1916 it would finally happen as the men who had volunteered in 1914 began reaching the front in great quantity. There they would play their part in the worst single day in British army history. On the grey wastes of the North Sea the Royal Navy would finally get its chance against the High Seas Fleet, and the result would be disappointing. On the side of the Central Powers first up we have the Ottoman Empire. For an empire that was considered to be crumbling in on itself in 1914 the Ottomans did a fantastic job in 1915. Pretty much as soon as they entered the war they found themselves attacked on multiple fronts from multiple enemies. In Mesopotamia the British had landed at Basra and began a march up the Tigris and Eurphrates rivers only to be stopped outside of Baghdad. Then the British army there had retreated to Kut where they were still under siege at the beginning of 1916. Against Russia in the Caucasus the Ottoman attacks had been failures but when the Russians attack the defense did a bit better. They had given some ground and lost large parts of Armenia but the front had no collapsed. At Gallipoli Ottoman troops found their greatest triumph of the war when they managed to keep the British and French invasion force on the beaches for the entire summer. The only real negative you can say about their performance on the peninsula was that they failed to capitalize on the evacuation. With the evacuation completed the first week of January 1916 I am sure there were many people in Constantinople that could breathe a little easier for the first time in almost a year. The year of triumphs would only be marred by the Armenian Genocide that would begin in 1915 and run for the duration of the war. Along with the Ottoman Empire the Austro-Hungarian empire also reached its high point during 1915, things did not start off well, for sure, but over the course of the year things just got better and better. With German help they were able to lay a beating on the Russians during the summer. This did come at a cost though. Throughout the year their armies became less and less independent and morphed into an arm of the German army. By the end of 1915 there were German officers that had been placed in all sorts of command positions. This was a process that would continue in 1916 and the rest of the war with the until they would lose all autonomy to the German high command. This change hurt national prestige but definitely improved the coordination and performance of the armies in Europe. The greatest success though, at least from a propaganda perspective, was the occupation of Serbia. Part of the Serbian army had escaped and found its way to Salonika but removing the threat from the south made it easier for Austrian troops to be moved to other fronts. While the freeing of troops was nice, it would not lead to a great 1916 for the Empire. The Russians would attack with force that nobody, not even the Russians expected and the Italians would finally learn out to fight a modern war. Finally, for Germany 1915 was a success, or a success as large as it could be without actually winning the war. On the Western Front they had stayed on the defensive, other than that one little attack at Ypres. They had held their ground against repeated attacks from both the British and French There defenses were the strongest of anybody's and their troops ability to instantly counter attack any advance was legendary. In the east Hindenburg and Ludendorff in the north and Mackenson in the south had laid some serious smackdown on the Russian forces over the summer. Germany's greatest problem in 1915, and then for the rest of the war actually had nothing to do with Germany and was instead the fact that they were shackled to Austria-Hungary who was not pulling their weight in the alliance and the weight of their ally would just keep getting heavier and heavier as the war went on. One of the best side effects for Germany was that the relative inactivity on all of its fronts for the last few months of year allowed Falkenhayn to stockpile a huge quantity of resources and preserve the strength of the German armies. When 1916 would start they would be 100% prepared to launch an attack somewhere, really anywhere that they wanted. Now that we have done a brief overview of the how each country was feeling at the end of 1915, lets look ahead to what you can expect from the show over the upcoming year. In 1916 Joffre and the French would try to keep all of their allies coordinated, and that meant spring and summer offensives on all fronts. Discussions of when and where these would happen would be part of that December the 6th conference at Chantilly that we have discussed so many times before. At this meeting many decisions were made about the conduct of the war but for 1916 the most important was a focus by all of the countries on the major fronts. That meant that Salonika, Mesopotamia, and Egypt would all take a back seat to the fighting on the Western, Eastern, and Italian fronts. Also, everybody would launch an attack at roughly the same time to prevent the Germans and Austrians from being able to shuttle troops back and forth. While none of the upcoming attacks would win the war, they would cause the Germans to have to move troops around several times so you could say they achieved their goal of keeping as much pressure as possible on the Central Powers. The smallest of the fronts of the war in Europe was in Italy, and 1916 would be the year that the Italian army would finally learn some very important lessons about modern warfare. Cadorna would change his tactics and focus all of his strength on a single objective instead of wasting it in spreading his forces over the entire front. Because of this change 1916 would see the Austrian defenders pushed to the very edge and the capture of Gorizia, in fact it would see the biggest Italian advance of the entire war that would finally take the fighting to new locations and off of the same places that the fighting had been taken place since the beginning. The Austrians would not be totally on the defensive though, in May and June they would launch an attack at what would come to be called the Battle of Asiago and it would be one of only two times that they launched large attacks on the Italians. It would be initially successful but it would unfortunately be weakened because reinforcements had to be shifted over to the Russian front because of an attack that would be named after one man, Brusilov. The Brusilov Offensive is one of the few instances of a First World War campaign being named after its commander. The only other example that comes to mind is the Nivelle offensives in 1917. Both of the campaigns are made up of multiple battles but historians have come to call them all by their leader's name and for Brusilov it is because so much of why they were successful was because of the Russian general. His attack was not even supposed to be the primary point of effort for the Russians in 1916 but I would end up being their most successful attack of the entire war. Brusilov's idea was an attack along a massive front, multiple armies over a distance of 300 miles. The goal was to make an attack on such a wide front that it was completely impossible for the enemy to counter and wide enough that it was bound to find a weak point somewhere. The Brusilov Offensive also saw some of the first use of infiltration tactics on a wide scale, something that the Germans would become famous for in its use during the 1918 offensive at the hands of their Stormtroopers. Unfortunately for Brusilov, even though his attack was greatly successful he would run into the great Eastern Front problem, just how large the distances were. Even at 300 miles his front was just a portion of the Russian front and the other attacks were an abject failure. But he would inflict casualties on the Austrians that they would never be able to recover from. He also would force Falkenhayn to move German troops from the attacks at Verdun to the Eastern Front at a pretty critical moment. From the vast distances of the Eastern Front we now go to the vast grey wastes of the North Sea where the Royal and Imperial navies had been trying to coax each other into an advantageous fight since the start of the war. While there had been clashes between the Battle Cruisers, like at Dogger Bank, the large battle fleets of both navies never got involved in the action. This would all change at the end of May when the two fleets would collide at the Battle of Jutland. 250 ships would be involved, including 58 off the largest warships in the world. For hours they could fire at each other while making fleet maneuver after fleet maneuver and in the end it would be indecisive. There would be a bunch of questions on the British side for why it wasn't a great victory in the Royal Navy tradition. 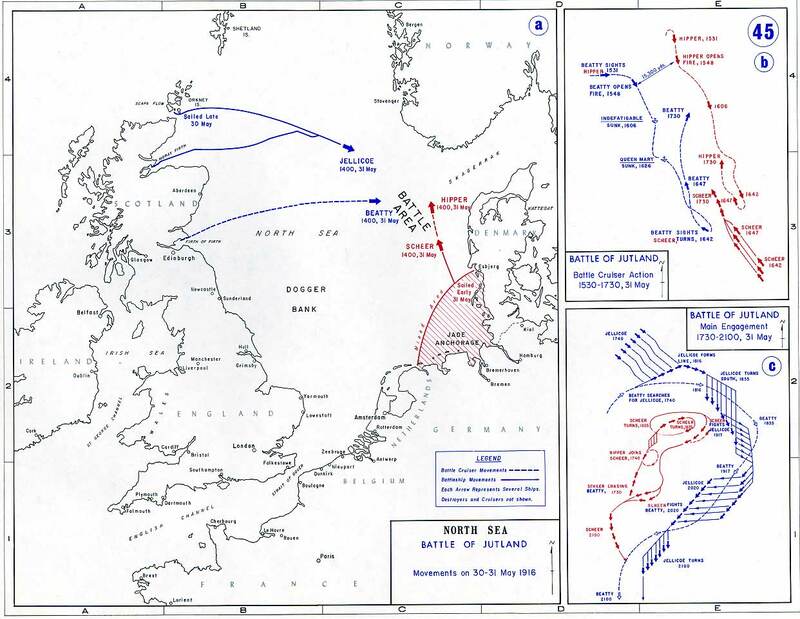 Why were the British unable to close with the enemy and destroy the inferior German fleet? Who was to blame for this failure? Beatty or Jellicoe? Why did the British ships have a surprising tendency to explode? All of the questions were asked and British Naval Historians spent the last century trying to figure it all out. Finally, on the western front two battles would consume the entire energies of all three countries involved. The Battle of the Somme was supposed to be the high point of British and French cooperation. The British had new troops arriving out of the training depots to use and the French would commit twice as many from all along the front and they would all attack side by side along the Somme river in northern France with so many men and so much artillery that they would blast a giant gaping hole in the German lines, or at least that was the plan. Then Verdun happened and the French had to greatly decrease their participation in the attack, even with the reduced number of troops the French contingent would be the most successful in the battle even though the British had more men. What happened to these British troops on the first day of the attack, July 1st 1916 would reverberate through British society to this day and the struggle on the Somme over the next five months would come to define the entire war for the British. The months and months of attacks when coupled with inflated estimates of German casualties caused a serious case of "I think I can I think I can" to set in on the British side when caused even more attacks, even though all of them were barely getting anywhere. The real questions would begin after the war though, when people started analyzing the battle and came to a somewhat surprising conclusion, maybe it was not a complete failure? While for the British the Somme became the battle of the war the battle that would become the epitome of the entire 5 year struggle was taking place around the small French town of Verdun. Falkenhayn believed that he could efficiently trade casualties on the banks of the Meuse near all of the fortifications around Verdun, but instead he probably lost the war there. So much of Verdun has become iconic, mostly for all of the wrong reasons. The absurd levels of artillery over a small area, the suffering of the French and German troops in the lines as month after month of the fighting continued, the heroic defenses of Fort Vaux and Mort Homme by the French, the mystifying losses of Douaumont and the Woevre plain by the French. The battle would also see the rise of Petain and Nivelle, one destined to be the leader to bring the French to the brink of defeat and the other to bring them to victory. I don't want to say too much more about Verdun, because our episodes covering the 10 months of fighting will begin in just two weeks. And here we come to the special programming note section off the podcast. This year of the show will be similar to last year, episodes every week assuming I don't break any more bones. However, the schedule during the first two thirds of the year is dominated by Verdun and the Somme, like most histories of the war. These are extremely important and extremely lengthy campaigns so instead of breaking them up I will just be covering them all at once, just like I did Gallipoli last year. There will be many smaller topics covered in the other weeks though, and towards the end of the year. I am also going to be working a book recommendation into each episode that is usually pertinent to the information being discussed, there are so many great books about the war and they can provide infinitely more detail than I can on a given topic. Another way to find out about these book recommendations is to follow the show on Facebook and Twitter, I post a link every week to the information about the book so I even save you the time of searching on Amazon. So that is facebook.com/historyofthegreatwar and twitter.com/historygreatwar. Now finally, we come to the largest change in the show for this year and that is the introduction of a Patreon campaign for the show. Up to this point so many listeners have been so generous with donations, but I think it is time to take the show to the next level. Patreon is a crown funding platform designed for independent creative works, just like this podcast. You can subscribe to the podcast for a certain amount every month to help support future episodes and also receive access to special subscriber only benefits. The most important of these benefits is access to special subscriber only episodes which will be released every month. I feel like it is important to mention that these episodes will not change what is being released every week on this feed for free, they are more like footnotes and backmatter from books, they won't leave holes in the free narrative, but they will hopefully add some icing on the top for those who are interested. These episodes will probably be all over the place in terms of topics and will in large part be driven by what subscribers want to hear. I already have some ideas though, I have a few What-If episode written up, which are always great fun to postulate and think about. I have two episodes available for new subscribers that I am calling Falkenhayn Annotated where we take a real deep dive into General Falkenhayn's war memoirs with commentary afterwards about the contents. I also plan on doing some more in depth book reviews on the feed, there are so many books about some topics that it is hard to know which ones are good to pick up first and which are good for later. There will also be some random episodes along the way that do not really fit into the normal podcast feed. So, if you are interested in supporting the show head over to patreon.com/historyofthegreatwar and check it out. Again that is patreon.com/historyofthegreatwar. And that is all for the first episode of Series 3. I hope you will join me next week as we look at the topic of Shell-Shock and how it was handled, or mishandled, during the war.